Here is a dump of some of my photos (the ones that turned out) anyway) from a collection of models submitted in the modelling competition for the 2011 Narrow Gauge Convention held at the Workshops Rail Museum at Ipswich last Saturday and Sunday. What can I say about this - WOW! Maybe the royal wedding could have been held here? Model Railway Show this Weekend in Brisbane - Whoopie! This weekend is the annual Brisbane Model Railway Exhibition to the RNA showgrounds. This show is hosted by the guys from AMRA's Qld Branch. As usual, I will be working with Jim Hutchinson on the Structure Building Stand. I'm there on Saturday and Monday, Jim on Saturday and Sunday, with a few ring-ins on other days. One ring-in in particular will be Geoff from Splitters Swamp Creek fame who will help me on Monday. Our Club will also have our HO Exhibition Layout in attendance and the N scale Exhibition layout in attendance. So any of you fellow bloggers or blog-followers come by and say hello. This afternoon I hit the shed and filmed a few more videos. However, the battery in the camera must have gone flat and it lost track of time so to speak. I did not know this until after I had uploaded the videos I had taken. Yesterday and today I attended the Narrow Gauge Convention at the Workshops Rail Museum at Ipswich. My first job on Saturday morning was to assist Mr Mewes (Lefty to many) a fellow Tuesday Nighter, a fellow Presenter and Curator at the Workshops Rail Museum in booking in all the modelling entries for judging during the day. There was bedlam there for a while as Dave and myself came to terms with what was required. Not many entries, but enough to keep us busy for 30 plus minutes solid. Some very nice models as well as some very nice photographs on show. A quick perusal of the attendee list, brought up a few surprises. Two members of my Club that I did not know were attending. As well as a past member. A couple of NSW modellers - fancy that at a Narrow Gauge Convention, but then the Victorians piped up, saying standard gauge is narrow gauge. Quite a few well known shops in attendance as well. Centre stage were a collection of QR models from some very famous QR modellers from AMRA history as well as a very new kids on the block with their wares. My camera battery ran out today - Bugger! There was a good selection of topics to attend, with some sessions repeated during the day so you could make a choice as to what sessions to attend. You could not however, attend all sessions. Some sessions were held by themselves, like a keynote session at a conference, while at other times during the day, there were two and three sessions running concurrently. It was amazine that there was common themes running through the sessions. I was second last up on the Saturday afternoon with my Styrene modeling session. Today, a quick change of the program as attendees were thinning out, and instead of the two sessions in Auditorium 1 and 2 being run twice, an Executive decision was made and they were run one after the other. That way I could attend Ian Fainges session on Sculpting. Very Nice. I ran the last Session of the Convention on Constructing a Dunny in O Scale. Amazingly quite a few turned up to this sessions, with 6 people participating in the building process in the 30 minutes session that ran slightly over time. Nice people, great food as well as tea/coffee. Fantastic Organisation, and a great set of notes. We also got go on a Behind the Scenes tour of the Museum, where the public is not usually shown. Well done everyone. I understand the next one is in Victoria. So on Good Friday I worked out thanks to PK how to set the date on the camera. What was in the manual did not work, but PK found something buried on a website somewhere and it worked eventually. So here are the next two installments of my layout travel. First from Cassino in the Loop round the helix to the top deck at Fairy Hill Loop on the mainline. The second is from Fairy Hill Loop through Kyogle, over the Upper Richmond River, around the Cougal Spiral and into Border Loop. What you cannot see is the scenery and the detail items off to the side of the track, particularly on the inside of the curves, as the camera point to the outside. Hopefully tomorrow I will complete my trip from Border Loop through to The Risk, then the Risk to Acacia Ridge Yard. Then I will have the branch line to cover before I come back the other way. As mentioned in last weeks post, I spent time last weekend while down the Gold Coast with the Family for 5 days sitting at the coffee table in the lounge of the unit scratch building 2 more ballast wagons. I have put together quite a few of these wagons. However, these two were special. I had previously acquired off the net a couple of photos of some special versions of the NHBF ballasts. These had side discharge chutes. The photos came from the Kieran Ryan's ARDP which has some absolutely brilliant shots. They are on CD#3. 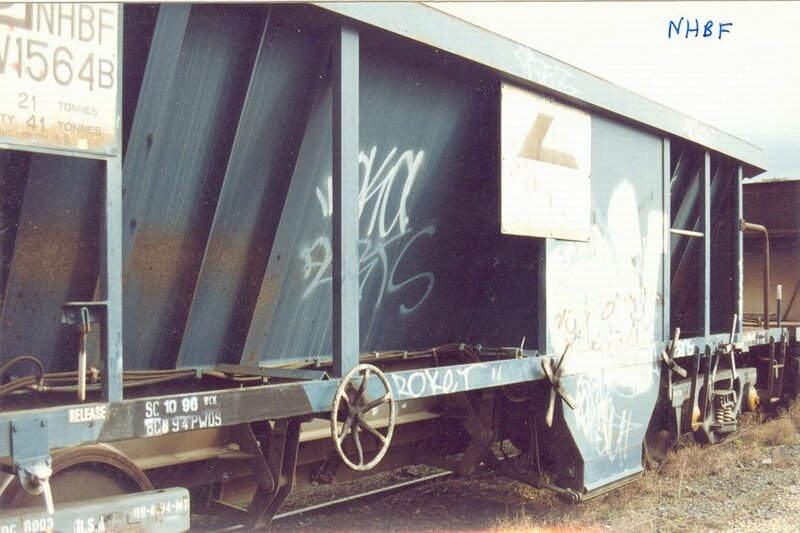 So here are my versions of the NHBF Ballast Wagon. This week I had a couple of days off work and I will also have a few off next week, as I am down the Gold Coast with the family. I had planned to spend some time preparing for the Clinic I will be doing next Sunday at the Workshops Rail Museum, for the Narrow Gauge Convention. But this hasn't eventuated. However, I did take some train related work down the coast with me. On Thursday I fitted bogies and KD's to 3 scratchbuilt NOCY wagons that have been sitting around for a very long time. I also fixed a bogie screw to an old OCY wagon that was previously lost somewhere on my layout during a running session. It is amazine that a wagon can continue to run even though the bogie screw has come adrift. I also fixed a coupler that had almost come off a NPRY cement wagon. On Friday I fitted the top lifting rings to 5 x N scale coil steel containers. I then did the same to 6 x HO scale coil steel containers. 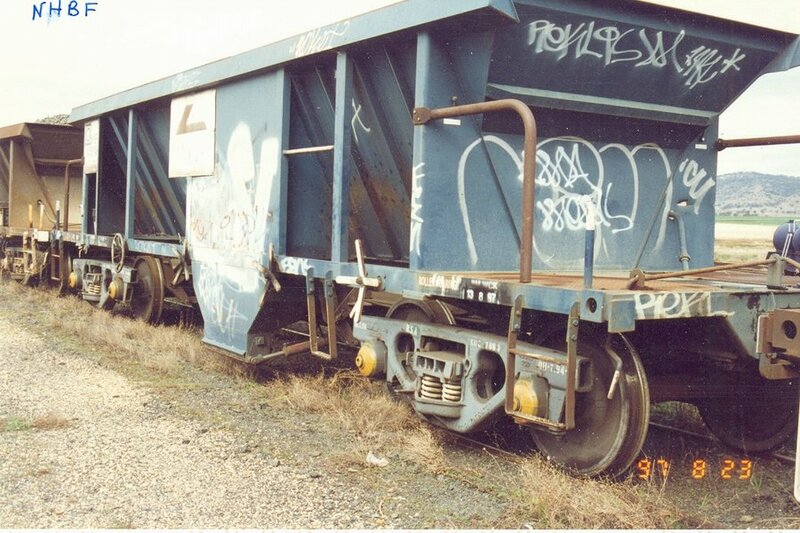 On Saturday the plan was to start building 2 x NHBF ballast wagons. But these wagons are special as they have the side delivery chutes. I had previously acquired a few pictures from the web of these unique wagons. So work started on the base and cutting out the sides and the other components for the hopper. Today I added the bracing to the sides and assembled the hopper onto the base. I then built the side frames and side delivery chutes. The two wagons are starting to look pretty good. I will try and finish the wagon off tomorrow. All this activity was interspersed with trips to the beach and the pool, as well as the shops, visits from my sister, one of her daughters and her three kids, and another visit from the wife's mother and one of her sisters. It has been very relaxing. This week started with a Tuesday Nighters meeting at Warren's place. It was here that I tried out my new spy camera. I did take a video in Warren's train room of the Tuesday Nighters in attendance. Friday night was a Buy and Sell at the AGMRC at Carina. Darren, Geoff, Shelton and myself went along to check out what was available. Luckily I picked up some AR kit bogies at a very good price - 7 pair for $26. Saturday started with a trip to Austral Modelcraft to pick up two NCE Snap-its from Ray. These were connected up today but I can't get one to work. I think I will pull up the point and replace it. The second works great. After this, it was a trip to the RMCQ Clubrooms at Brendale as it was a meeting day. We were discussing the new HO Clubroom layout. I showed off my 3D model of the proposed layout and a sample track plan. Work was also progressing on the new river module in the hope of being ready before the May Show on 30th April to 2nd May in Brisbane. Don't worry - it will be. Today I went down the shed and set up my new miniature camera on a container wagon and ran from Grafton Yard through Rappville to Cassino. Here are the two staff sections. This week I really need to work on my clinic notes for the Narrow Gauge Convention at the Workshops Rail Museum in Ipswich in two weeks as well as my powerpoint presentation. I Turned 50 on Tuesday! No not my age, but in followers! Woo - Hoo! I now have 50 people that follow me at least in public. That does not show who follows me in private. I know I have some work mates and business acquaintences who check the site from time to time as well and they are not followers. The 50th person was my boss from work Shaun. When I check out my stats in Blogspot I see that I have pretty consistantly about 1800 - 2100 hits a month on average. Did you know that the peak time of the week for viewers is on Sunday night? I wonder why? So hopefully, at least sometimes anyway, these 50 dedicated followers might get something out of my posts. At least from time time, I trust they get a laugh or a smirk. 50 men in the Shed! Not really as they would not fit. Tuesday night this week was spent completing my notes for the Convention booklet for the Narrow Gauge Convention at the Ipswich Workshops Rail Museum over the Easter weekend. They were due to be submitted on Wednesday, so they can be included in the convention proceedings. I have also almost finished my Powerpoint presentation to go with the notes for my Styrene presentation. That just leaves me to complete my O scale 1:48 props for the presentation, the notes and plans for the Clinic that I will be doing on the Sunday, and the my demonstration models for the Clinic and kits for the attendees to put together. I will be also away for a few days between now and then so time to complete all these might be a bit lacking. So today I spent some time doing some models. These include some fence posts, a picnic table, a 3 cubic metre industrial bin and a screen door. I also spent some more time on my dunny. I created the pan that gets removed out the back door. I also attached the door and yes it opens and closes on some new hinges I created. Weren't they an absolute pain to create. This week I also glued a plan of my proposed HO clubroom layout to some cardboard and created a scale 3D model of the layout. I just feel that some people cannot visualise a multi-deck layout. That just leaves me one week before the next Club Meeting to present the track plan which I will also draw on some other copies of the photocopied layout design, but these won't be in 3D, but I will have some potential scenic suggestions annotated on the plan. On the front right Blob, there will be a return loop on the bottom level as well as a spiral up to the top deck around the edge of the mountain. The bottom deck at the front will be staging, and will incorporate another return loop around the bottom blog, with a helix inside this up to the top deck. The bottom level along the back wall will feature a large station complex for the passenger train fraternity and the finger to the right hand side, may well be a mine comlex. The finger off the left hand wall will be a branch on the back side (it may even be 12mm narrow gauge) and a rather complex shunt area on the front of that peninsula. I think we will inclue a timesaver shunting puzzle within this area so we can amuse members and visitors alike with some real complex shunting. There will be lots of other places to shunt wagons to on this deck as well. Well, haven't I had some issues with the delivery of my recently purchased camera from WOW. The first attempt was ballsed up by just 30 seconds, with the wife seeing the TNT delivery truck backing out and driving off as she came in the other end of the street. They want someone to sign for the delivery and with my luck with the wife in and out like a yo-yo going to school, the shop etc., it is just certain she and courier will never meet up. Re-delivery was attempted at my work address two days later at the roller door to our dock down a lane way in the middle of the city. But the courier reported that the company was closed at 9:16am - I don't think so sunshine! I'm sure the did not even try to deliver it as we had painters down in the dock all day on Friday and the roller door was open as well as I had briefed our ever helpful storeman in advance of a personal delivery from TNT. So the next attempt will be scheduled back at home on Tuesday and I will stay home until the delivery driver turns up and then I will head off to work late. But I will be leaving work reasonably early on Tuesday as this is Tuesday Nighters at Warren's place. We have not been there for well over 12 months. So it will be good to check out what he has done, as he has converted from US standard gauge to Narrow gauge. With a bit of luck, next Saturday I may be able to create a cradle to secure the camera so that it fits into a 20' container slot on one of my container wagons and it will be able to do the rounds of the layout, puched by a sound equipped loco.